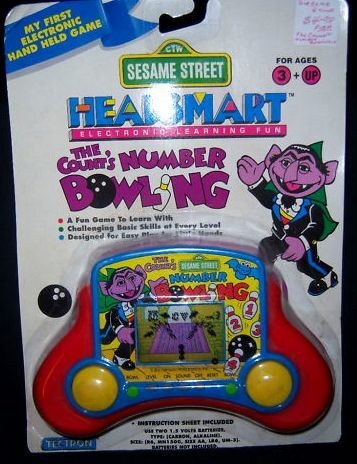 @NEStalgia I didn't have many as a kid, but I did have the one pictured above. It was pretty fun until I had the bright idea to play with it in the bathtub. I remember when my mother got me one of those 9999 in 1 brick games. It was mind blowing to 5 year old me. @ReaderRagfish Wow, that was a remarkable idea.....I mean.....not even the internet came up with "WiiU can be played in the bathtub." They left it well enough alone with playing on the toilet where it belongs. Referring to the bathtub story, I have one from an acquaintance of mine. They loved Chrono Trigger (SNES) so much as a kid that they took the cartridge with them into the bathtub. Needless to say it didn't work after that. @NEStalgia I was about 5 and didn't know that water killed electricity. @Blitzenexx I used to have a job in high school where 4 nights a week I'd sit at the front desk of a lobby for 4 hours buzzing people in. It was a very uneventful job, and I didn't have much homework, so I'd have tons of time for RPGs. It was wonderful. I'd bring my DS every day with Dragon Quest VI (I'm all about Dragon Quest if you couldn't tell) and play only that the whole time every day since I didn't have any other games I wanted to play. Loved every minute of it. And after 3 months of this I finally beat it. -Query returns over 24k rows. -Use a foreach loop to go through all the data. -Use another foreach loop inside the first loop to go through all the data again. -Repeat the same process five different times. I guess that solves the mistery of the page that took 30 minutes to open. YouTube Rewind 2018 was actually the worst video I've watched this year. @Delibheel Are there no search functions built into the standard library or something? @ReaderRagfish the query requests information from a view, that combines data from four different tables into singular rows. This code breaks the pieces and arranges them in understandable arrays. It just needed some optimization. Made it go from a few billion loops to just under 100k. Which could probably be improved, but I guess that's fine for now. @ReaderRagfish: The irony is that my job requires a lot of sitting. The waiting? Not so much. I do a lot of bug fixing and some feature creation/enhancement, so unlike Hobbit I can only automate so much. XD I could probably get away with gaming over my lunch, but the few times I do bring something, it's usually a book. What do you think of DQ VI? I've considered that one as well, but price and some meh reception have kept me away from that one. @Blitzenexx Loved VI. V was the first one I played, but VI was my second and what made me consider myself a fan of the series. The "meh reception" you speak of has more to do with it being one of the less beginner friendly entries. The job system confuses some people (although it's really not that complicated), the world map is extremely intricately designed so progressing to new towns and areas will require some thought, and the final boss is brutal. But in terms of the battle mechanics and exploration, it's one of the best in my opinion. My rankings of the games would be IX>VII>VI>V>III>VIII. Haven't played IV or XI, and I and II are sort of their own thing. @Delibheel: What are you working on? Web app? I'm also kinda curious what language(s) you're using. "View" brings to mind a MVC structure. @ReaderRagfish: Maybe I'll play VI someday if I can find it at a more reasonable price online. Same with IX, though it isn't as pricey according to what I've found on the interwebs. I'll likely end up dipping into the used market for both at this point. The only one I've played and finished is V, which I really enjoyed. I have IV and VIII backlogged. I don't ever expect to play the first three but would like to try all the others...barring X for obvious reasons. Nope, nobody else who has worked with databases has ever run into this before. @Blitzenexx it's just old regular php and postgresql (in this case the view in question is a literal sql view). I don't work directly with the phone app itself, but this particular file is used by the app. I usually just work on the desktop sites. But every now and then get to play with the app files. @Blitzenexx Looking at ebay, you can get VI for about $50 (or $30 if you go loose). Not an amazing price for a DS game, but not too bad compared to buying a brand new Switch or 3DS game, and the game is long enough that you'll likely get your money's worth if you finish it. I'd say play some of the others first. Then, if you really like them and are still hungry for more, go for it. @Delibheel: I've dealt a little with postgresql (mainly when I was briefly in Ruby On Rails), but a lot of my DB work happens in SQL Server these days. I actually had a class on PHP back in college, but the syntax just never set very well with me. Sounds fun at any rate! Edit: To answer the above, Dragon Quest. @ReaderRagfish: That's precisely my plan for the time being! I intend to just stick with the ones I have for now. I likely would have caved for DQ XI on 3DS if it had ever made it outside of Japan though. There's always (well, hopefully) the Switch for that. @Delibheel Dragon Quest. I'm not a huge fan of Final Fantasy to be honest, although I have enjoyed a few of them. VII in particular is the main one I occasionally feel compelled to go back to. @Blitzenexx My plan was to buy both the 3DS and Switch versions of XI the day they came out. Then they announced that the 3DS version wouldn't come west and the Switch version would be delayed with progress being slow. I was pretty frustrated. @the_shpydar It was pretty rad for sure.